Gregg Langbehn's manager at high-A St. Lucie expressed confidence in the lefthander in 1991, according to The Palm Beach Post. "Anytime I send Gregg Langbehn out there, I've got a chance to win," John Tamergo told The Post that August. "Give the kid two or three runs and let him pitch relaxed. That's a different ballgame." Langbehn ended up pitching in eight pro seasons, but he never got a chance to pitch relaxed in the majors. He later continued in a different role at the ballgame, as a manager in the minors and independent leagues. Langbehn's career in baseball began in 1988, taken by the Mets in the 11th round of the draft out of Everest High School in Wisconsin. Langbehn has also been credited as Greg Langbehn. 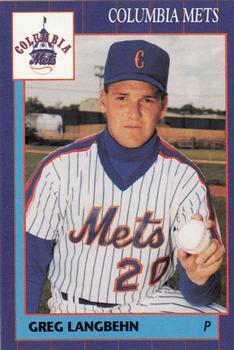 Langbehn started with the Mets at rookie Kingsport. He went 3-3 over seven outings. At short-season Pittsfield in 1989, he went 10-3, with a 1.80 ERA over 14 starts. He went 13-11 at single-A Columbia in 1990 and then 10-12 at St. Lucie in 1991. He made AA Binghamton for 1992 and turned reliever. He turned in a 3.17 ERA over over 52 mostly relief outings. Langbehn made AAA Norfolk in 1993, then again for part of 1994. He then saw AAA Pawtucket with the Red Sox for seven outings in 1995, his final season as a pro. By 2001, Langbehn had started his coaching career. He served that year as hitting coach at rookie Martinsville with the Astros. He then moved up to the manager's office in 2004 with short-season Tri-City. He spent four seasons at Tri-City, then served as manager at single-A Lexington. In 2010, he moved to independent Traverse City and served as manager there for four seasons. Langbehn signed on with the Indians in Cleveland in 2014 as replay coordinator. "It was a great experience, an awesome job," Langbehn told The Washington Observer-Reporter in 2016 of his time with the Indians. "It was two years of watching every single pitch because if something happened, then you better have an answer. I wouldn't trade that experience for anything." He spoke then after he returned to his old job as an independent league manager, helming the Washington Wild Things. In February 2017, the club extended Langbehn through the 2019 season. "This extension shows Gregg’s commitment to the Wild Things organization and the Washington community, striving for greatness on and off the field," team GM Steve Zavacky told The Observer-Reporter. "The stability he provides this franchise is outdone only by the leadership he offers our players."